Storyline allows you to quickly add all sorts of question types to your course. In this tutorial, we'll take a look at how to create a new quiz question or survey question, using one of Storyline's ready-made question types. If you'd like more flexibility to create your own interactive questions by converting objects on your slide into answer choices, you should also explore the Freeform Question options. Click the Home tab on the Storyline ribbon and select New Slide. Or, click the Insert tab on the Storyline ribbon and select New Slide. Or, in Normal View, right-click the workspace in the slide thumbnails area at the left and choose New Slide. Storyline shows the thumbnails for each question type available. 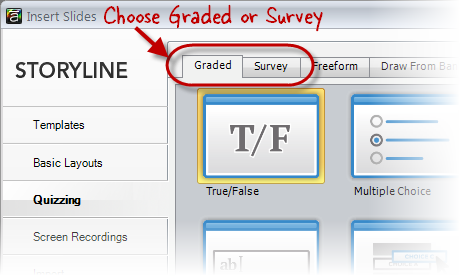 The question types depend on whether you're adding a graded question or survey question. Click any thumbnail to explore the choices — the panel at the right edge of the window shows a description of whatever question type you click. Note: If you want more flexibility than what the standard question types offer, you can instead build a Freeform question in Storyline. This allows you to create questions or interactions out of your own shapes, images, textboxes, and more. 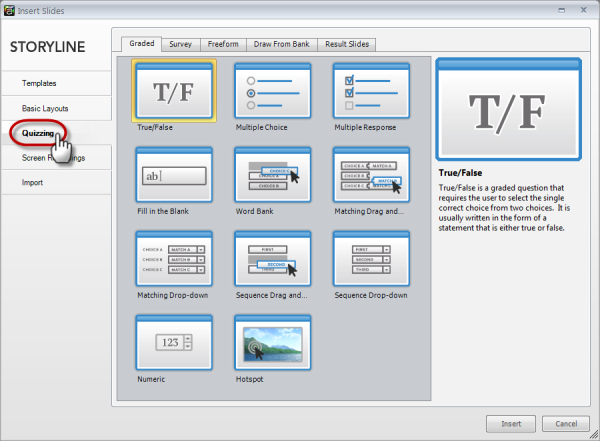 See the tutorial on Converting an Existing Slide to a Freeform Interaction. Once you find the question type you want to use, click Insert. For some question types, you can choose to shuffle the answer choices. 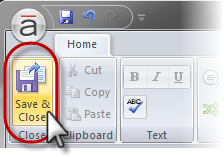 Use the Shuffle dropdown on the toolbar to turn shuffling on or off. If you’re building a graded question, choose one of the following from the Score selector on the toolbar. (For survey questions, the Score selector isn't available, since there’s no right or wrong answer). By Question: This is the default, and it allows you to assign points to the correct and incorrect answer. By Choice: This allows you to set up a different score for each individual answer choice. This option is only available for Multiple Choice and Word Bank questions. 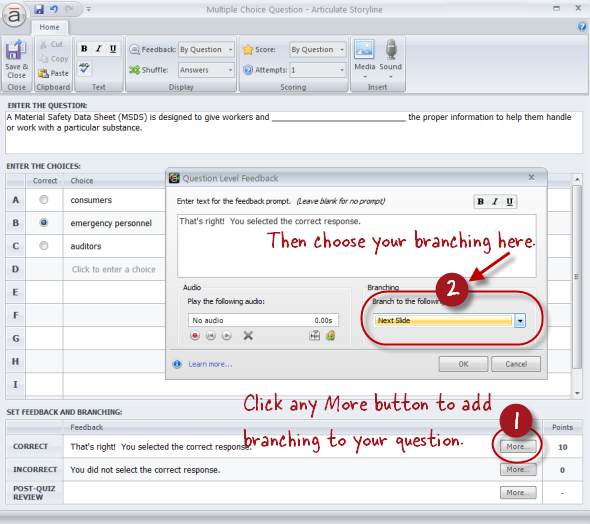 By Question: This allows you to set up question-based feedback and branching. For a graded question, you can show different feedback for a correct vs. incorrect answer. For a survey question, there’s just one feedback message for the question overall. By Choice: This allows you to set up different feedback for each individual answer choice. This option is only available on some question types, such as Multiple Choice, Word Bank, Pick One, and Which Word. None: Choose this if you don't want any feedback to display and you don't need to branch the learner to a different place in the course based on how they answer. If you opt to display feedback, you can edit the feedback text in the Feedback area of the question editor. (This appears at the bottom of the question editor if you chose Feedback By Question, or next to each answer choice if you chose Feedback By Choice.) Or, when you return to the Normal View of your side, you can make the changes to the feedback layers that Storyline creates for you. (Learn more about slide layers.) If you want to change the visual design of the feedback layers throughout your course, check out the tutorial on Working with Feedback Masters. For graded questions, you can also include Post-Quiz Review feedback. This feedback appears during the quiz review, if you provide your learners with a Result Slide that includes a "Review Quiz" option. 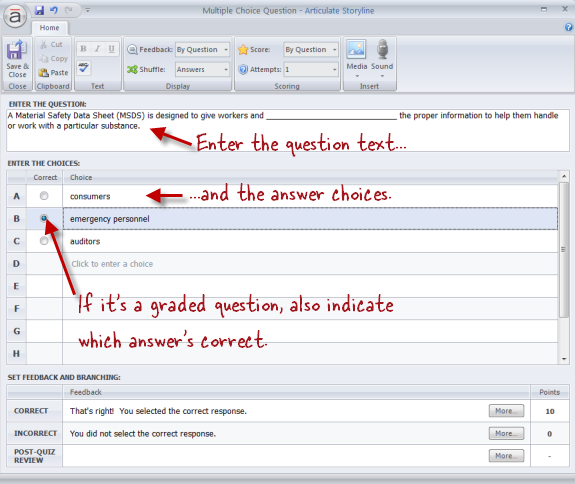 In the Post-Quiz Review field at the bottom of the question editor, enter the review feedback you want learners to see. If you want the "Try Again" messages throughout your course to look a certain way, you can make changes to the Try Again Feedback layout. For more details, check out the tutorial on Using Feedback Masters. The Media and Sound icons on the question editor's toolbar are handy if you want to add pictures, movies, or audio to your question slide. But you can add those things just as easily later, when you return to Normal View. To add other things to your slide (such as screenshots, shapes, captions, characters, web objects, zoom regions, and more), you'll need to return to Normal View first. Click Save & Close to close the question editor and go to the Normal View of your slide. Here, you can enhance your slide content with any of the other Storyline tools (such as animations, transitions, triggers, or the Timeline) — just like you would with a content slide. If you chose to provide feedback on this question, or if you chose to include a post-quiz review message, you'll see separate layers for each of these in the Slide Layers panel, and you can edit those layers if you like. What About a Quiz Result Slide? You can display quiz results at any point in your course by using a result slide. When you create a results slide, you can tell Storyline which questions in your course you want it to use for calculating the results. If you've already added a result slide in your course, you can assign the current question to it like this: with your question slide In Normal View, find the Question panel at the right edge of the slide workspace. Use the Result slide selector to choose the result slide to which you want to connect this question. How Do I Edit My Quiz Question Later? If you need to make changes to your quiz question later, you can go to your quiz slide and edit the content directly on the slide itself. 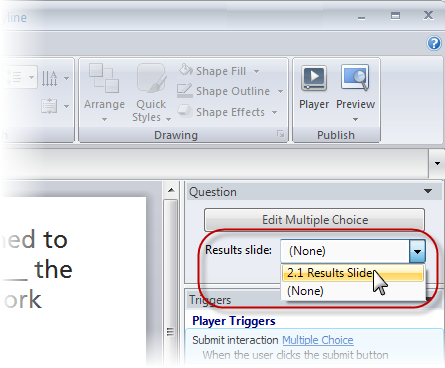 Or, if you need to change other things about the question that aren't visible on the slide (such as the scoring, number of attempts, or how feedback is handled), just click the Edit button in the Question panel that appears to the upper-right of the slide workspace.That brings up the Form View of the question editor where you can make whatever changes you need. Click Save & Close when you're done.